States depend on a variety of sources for tax revenue, but one of the most common are individual income taxes. This week’s map shows state and local combined individual income tax collections per person in 2011 (the latest data available). This category includes broad-based taxes on wage and salary income, as well as taxes on specific types of income (such as investment income taxes on interest and dividend income). Most states that levy an income tax have the broad-based, former type, but a few states (namely New Hampshire and Tennessee) only tax investment income. Six states have no individual income taxes (Alaska, Florida, Nevada, South Dakota, Texas, Washington, and Wyoming). On average, state and local governments collect $918 per person from individual income taxes—but some states differ significantly from this trend. New York collects the highest, coming in at $2,289 per person. Maryland follows, with $1,823 per person. Rounding out the top ten are Connecticut, Massachusetts, Oregon, Minnesota, Delaware, California, New Jersey, and Virginia. 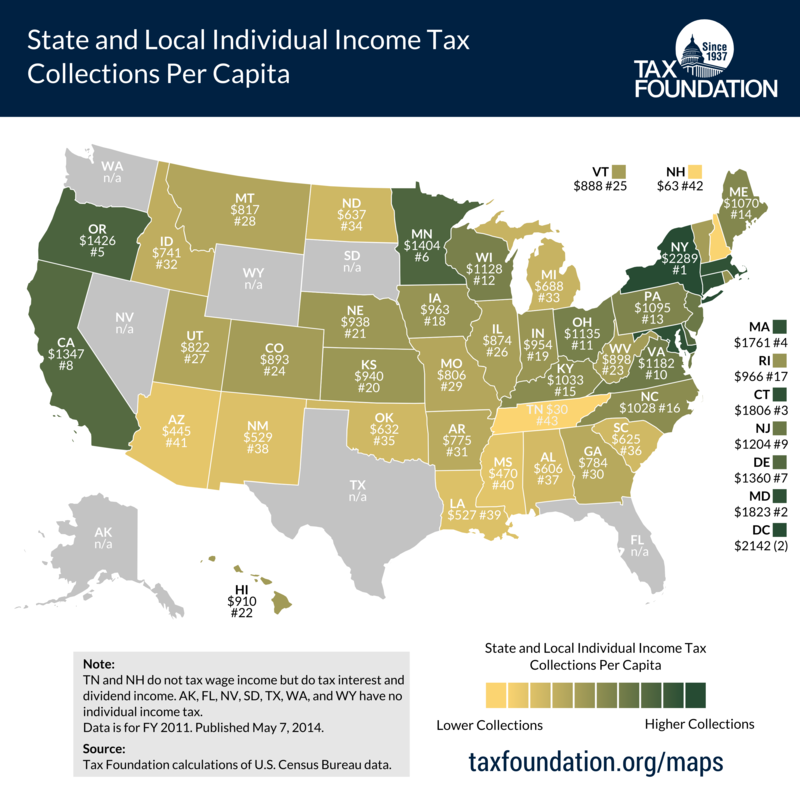 Among that state that levy income taxes (excluding no-income tax states), Tennessee and New Hampshire collect the least per person ($30 and $63, respectively). This is because these states have narrow income tax bases, taxing only investment income. Among states with more broad-based income taxes on wage income, Arizona collects the least per person ($445), followed by Mississippi ($470), Louisiana ($527), and New Mexico ($529). Individual income taxes tend to be a state-level tax—91 percent of combined state and local collections in the U.S. are levied at the state level. Only 13 states collect local income taxes, but some of these obtain a sizeable share of local-level government taxes from this source. For example, 30.4 percent of local tax collections in Maryland come from local income taxes. Similar states include Kentucky (24.9 percent of local tax collections are derived from local income taxes), Ohio (21.3 percent of total local tax collections), Indiana (19.6) Pennsylvania (17.5 percent), and New York (10.8 percent). For more information on local income taxation, see this report from 2011. For an example of the complicated nature of local income tax systems see, this testimony before Ohio’s House of Representatives Ways and Means Committee.